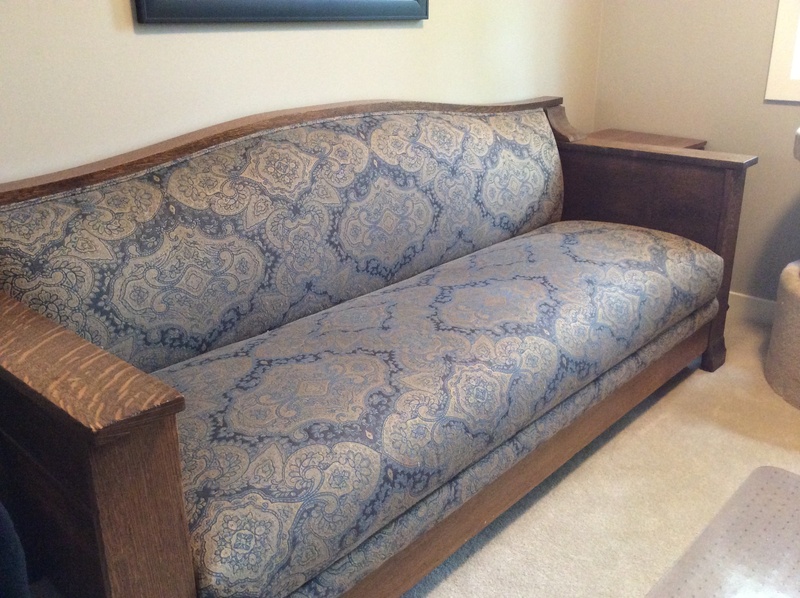 Beautiful Arts & Crafts sofa for sale, originally a C1900 hide-a bed. There are many reasons for partners, married or not, to disagree, but what kind of furniture to have in one’s home doesn’t have to be one of them. Since I deal primarily with clients that live in heritage homes you’d think that having antique furniture was a given, but that’s not necessarily the case. These disagreements have less to do with whether the furniture is antique or not and more to do with the lines of the furniture. Some people find Victorian and turn-of-the-century pieces too fussy with the curves, inlay, and carving that are prevalent in most furniture of this age. Others find the more modern furniture cold, lifeless, and akin to Pablum for a room. (Do they even make Pablum anymore? For the uninitiated, Pablum was a semi-solid baby food that was grey-beige in colour). 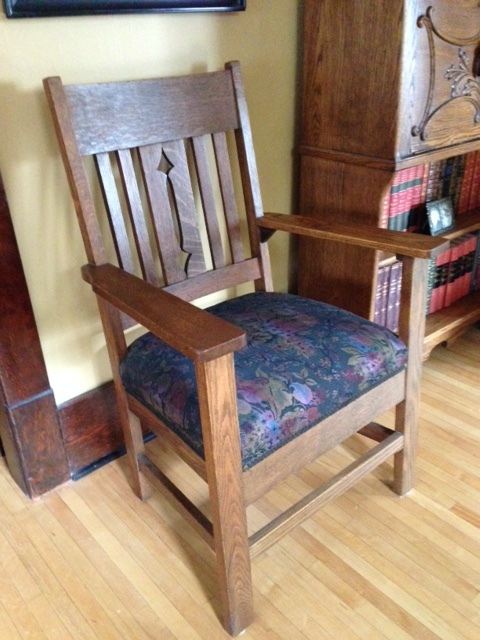 Arts and Crafts furniture, in my opinion, is a terrific compromise. The lines of the furniture are not fussy. In fact, they are very simple, almost modern, veering into the geometric, at least in North American. The British version of Arts and Crafts furniture, where the style originated, has some curves and inlay but the overall effect is still simple in shape. Simplicity of shape and construction allows the grain of the wood to shine. Most of the better pieces of furniture from the late Victorian era into the 1920’s was made of solid, quarter-sawn oak. Cutting a log to create the patterns that are so highly prized in such pieces of furniture is a practice that is no longer financially feasible or environmentally friendly. Some modern reproduction pieces are made in this way, however they are much more expensive than straight-grain oak. In summing the benefits of this style of furniture, Arts and Crafts furniture pleases the eye of the modernist with its clean lines and sparse details as much as it please the person who loves antiques because of their age and character. And something else even more amazing? Buying original pieces rather than contemporary knock-offs will save you anywhere from 50-75%! They will be smaller in scale and thus, fit perfectly into heritage home. PS: The armchair and sofa are often called Mission style furniture. So what’s the difference between Arts and Crafts and Mission? Stay tuned! Hi Johanne! I’m going to try and send you an e-mail here, but just wanted to give you a heads up that I’m doing so, so hopefully it doesn’t end up in your ‘junk’ box. I love looking at your site and reading your blog – love this style of furniture, as well! Thanks for the kind words. I look forward to your email. Great sofa!…that would of went great with our place in Glenora. Now we have a mid century ranch in St. Albert that we plan on restoring to its original concept..so mid century furniture here we come ! Yes, the sofa is beautiful.There’s a lot of interest lately in mid-century modernism. Good luck with your restoration and finding those special pieces! I wish that I lived anywhere near Alberta, because that sofa is beautiful!